In my review for The Purge, I stated that the idea behind the movie had potential if taken in the right direction. 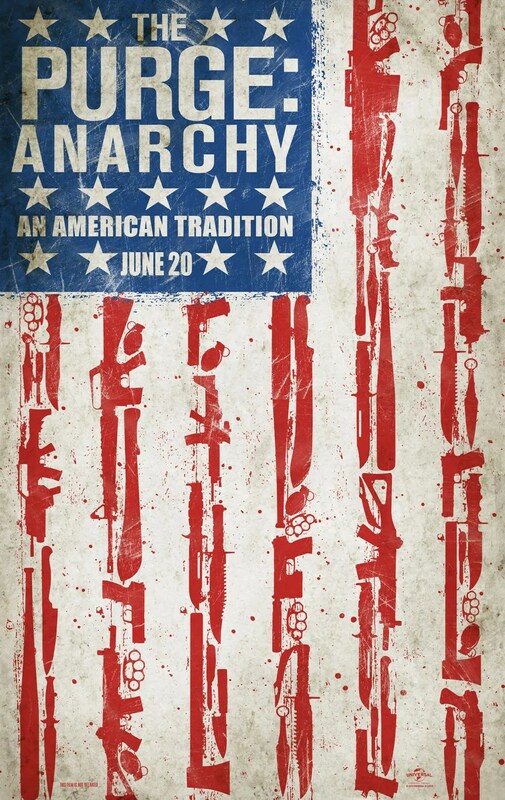 Anarchy takes the movie in that direction. The idea of The Purge, one lawless night when all crime is permitted, particularly murder, is a horrifying but intriguing one, ripe for creative story-telling. The first movie started small with a home-invasion angle, Anarchy takes the violence to the city streets. 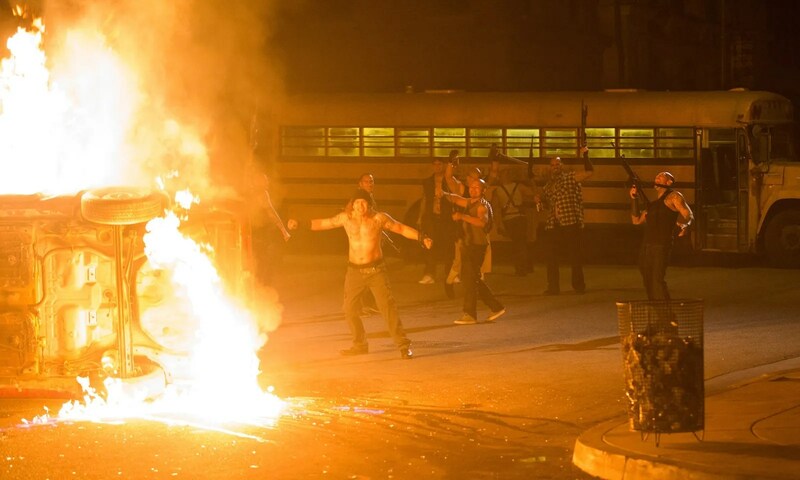 This means that Anarchy covers the overall effects of The Purge and the many different people it could impact upon. We get the street thugs, the rich, the Government and the everyday folks just trying to survive. 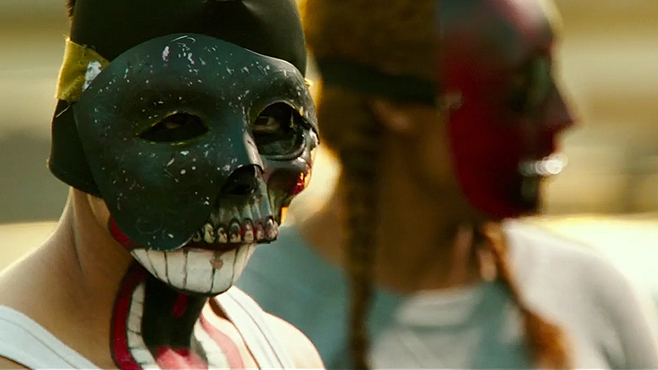 We see how the The Purge is used for revenge, for profit and how it inspires protest and rebellion. Most interesting of all is the difference between how the poor and rich “purge.” It is a concept that is full of different story-telling angles and to the movie’s credit, it covers a lot of them. This film focuses on five key survivors. They cover a multitude of clichés, from the separated couple, the rebellious daughter, the caring mother and the “hero.” It is the hero character who adds a different element to The Purge, making it feel much more like an action movie. Frank Grillo fills that role and does it well, demonstrating why he could handle many leading roles in the action or thriller genre. What it does mean is that the movie isn’t really scary. You would consider the first Purge a horror movie but would struggle to fit this film into that category. It doesn’t have “cattle-prod” scares like Insidious or the violence of movies like Hostel or Saw. The situation at the centre of the film is a terrifying one but there is little tension or suspense to build any horror. Instead, this movie is a thriller but a very good one. It trades scares for action and horror for interesting social commentary. The different ways people decide to “purge,” from rich to poor, and the effect that The Purge has on “ordinary” people makes for a much more interesting film than any shockingly gory, horrifying movie ever would. As interesting and original as some of the ideas are, the movie does fail to live up to its full potential. At times it can be slightly predictable. There are surprises and interesting twists but then these can be undone by the story treading familiar paths and there won’t be a huge amount that people haven’t seen before. It is still an interesting concept and developing the story so that it covers a wider area was a good idea. It is a franchise with potential to go even further and some interesting plot threads were dangled here which could make a further sequel even better. Overall, The Purge: Anarchy did the right thing by widening its area and covering the effect of The Purge on a whole city. It means we get to see the impact of The Purge on many different people in society, with different motives and methods. It lacks originality in places but still offers an interesting, albeit not very scary, story.